Individual introductory lessons are available at all venues. Introductory lessons may be longer than the usual 40 minutes. Alternatively, you may want to attend an introductory workshop. These small group workshops offer a friendly and informal opportunity to find out more about the Alexander Technique and how it works. Workshop places are £22 for the workshop on its own or £45 for a package including an individual lesson at a later date. Workshop places are limited and must be booked in advance. Please telephone 020-8690-0801 / 079-4003-3728 or send me an email for further information or to make a booking. If you would like to make an immediate reservation for a workshop space or to book an introductory lesson, please make a selection below. Please note. Your payment will be securely processed by Stripe. No credit or debit card information is collected by myself or this website. Please see Stripe's website for further information. Next Alexander Technique workshop at the Sunflower Centre in Brockley, SE4. Cycling with the Alexander Technique - click here for more information! I am also available for introductory group workplace sessions and would be pleased to provide further information should your organisation be interested. Please give at least 24 hours’ notice for a cancellation, otherwise the full lesson or workshop fee will be payable. 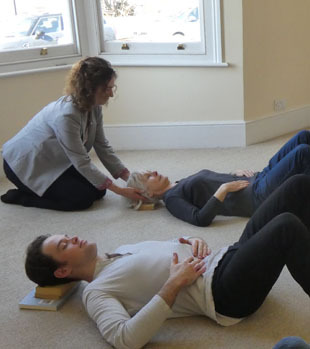 I run regular introductory workshops at The Sunflower Centre in Brockley and at my practice in Canary Wharf. Please click here for further information on dates and times. Comments from previous workshop participants; "very informative introduction to the subject", "practical exercises were very useful", and "Michelle was very good at putting everyone at ease". Click here to read how the Alexander Technique can help with healing after injury.